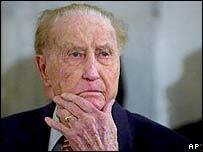 The late US Senator Strom Thurmond's family has accepted a mixed race woman's claim that she is his daughter. Retired schoolteacher Essie Mae Washington-Williams said her mother was a black maid working for the Thurmond family in South Carolina in the 1920s. "We have no reason to believe Ms Williams was not telling the truth," Thurmond's eldest son said. Senator Thurmond, a former champion of racial segregation, died earlier this year aged 100. Ms Washington-Williams, 78, said Thurmond had privately acknowledged her as his daughter. She had previously denied rumours that the country's longest-serving senator was her father. But she said he had revealed the secret now in the hope that it would bring some closure. Ms Washington-Williams said Thurmond got her unmarried 16-year-old mother pregnant when he was a 22-year-old living in his parents' home, long before his political career started. Her mother, Carrie Butler, later sent the child to live with her aunt and uncle in Pennsylvania. Thurmond ran for president in 1948 on a ticket of strict racial segregation, before leaving the Democratic party to further the cause. He joined the Senate in 1954. Years later he softened his tone on the issue of segregations, as the so-called Old South faded and the civil rights movement grew in momentum. Ms Washington-Williams' lawyer Frank W Wheaton said Thurmond had provided his secret daughter with "a very substantial amount" of money over the years, though it amounted to less than $1m. Ms Washington-Williams and Thurmond are said to have had a conversation in 1947, when he was governor of South Carolina. "He asked her directly: 'How does it feel to be the daughter of the governor and not be able to tell anyone about it?'" said Mr Wheaton. "She said it felt fine." She told the Washington Post, which first revealed her claims on Saturday, that she had waited until now to go public with her story because she did not want to embarrass herself or hurt Thurmond's career. Storm Thurmond Jr told South Carolina's The State newspaper he would like to meet his half sister. "Strom Thurmond was a firebrand politician"